Did he cheat? Are they getting a divorce? No—they’re still married, but consider Becky finished. 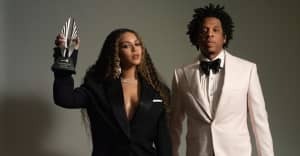 "Twitter is making it sound to me like Beyoncé just served Jay-Z divorce papers on live TV possibly in song format," wrote one confused fan during Saturday night's live broadcast of Beyoncé's short film LEMONADE. In fact, the visual album does not appear to document a divorce—its wider focus is the experience of black women in America and beyond. And along with Bey's daughter Blue Ivy, Jay Z co-stars in a makeup scene at the film's end, and the album is now streaming exclusively on TIDAL. Here's how people reacted as they heard those lines for the first time. BEYONCE: I'm gonna air you on TV in front of everyone. Jay-Z may want to check again on how many of his problems are related to women. Crazy how Jay Z can't leave the house for like another year now.